"3LA1, N/A" by Timothy K. Perttula and Robert Z. Selden Jr. CONTEXT INFORMATION: From a grave found at the south end of the Battle mound by Simon Cullins in 1938 during digging of a storm cellar. Associated vessels are V-1946 to V-1951. DECORATION: This vessel is lip notched. It also has opposing sets of trailed triangles on the rim and vertical trailed lines on the upper part of the body. The complete motif is not known on this vessel because it is only represented by a few sherds. 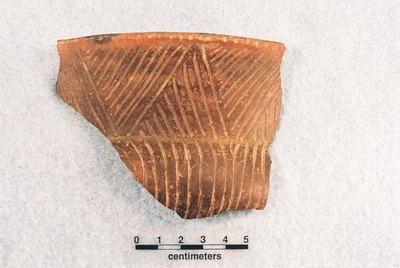 TYPE: Keno Trailed vessel, possibly related to Keno Trailed, var. Phillips (Schambach and Miller 1984:123).